Piper is a seventeen-year-old high school senior, and she's just been challenged to get her school's super-popular rock band, Dumb, a paying gig. The catch? Piper is deaf. Can she manage a band with five wildly different musicians, nurture a budding romance, and discover her own inner rock star, though she can't hear Dumb's music? 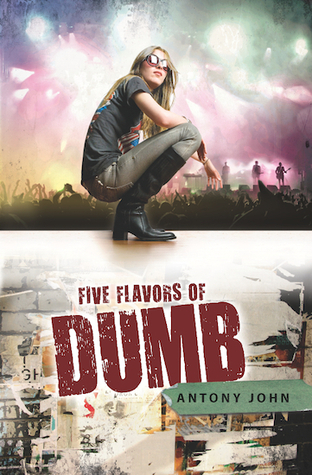 Five Flavors of Dumb is a novel I’ve had on my radar for awhile, but one I simply brushed off a countless number of times. It was never a priority on my list, but when I found myself stranded waiting for a long time with nothing to read but this novel on my Kindle, I decided to give it a shot. Well, it would be an understatement to say I was pleasantly surprised because more than anything, I was simply astounded by the depth of this tale. Five Flavors of Dumb is more than “just another music novel.” It’s a story about family, friendships, discovering yourself, and ultimately, belonging. One of the main reasons Five Flavors of Dumb and I hit off so well was because it was a primarily character-driven novel. Piper is the type of protagonist I love. While she knows she’s intelligent, she fails to see the other remarkable traits she possesses in a very realistic manner that never makes her come across as vain. Furthermore, as a deaf heroine, her perspective of life is different, all while seeming to be achingly familiar too. Seeing Piper grow, adjust, learn, and make long-lasting bonds of friendship was simply beautiful. John makes your heart beat in sync with that of his characters, so you as the reader are completely invested in their tale, even if you didn’t think you would be. In addition, Five Flavors of Dumb sheds a notable amount of light on band dynamics. As a lover of music, I adored seeing the dysfunctional members of this band, Kallie, Tash, Josh, and Ed, finally come together to create something more than just music. In fact, I’d go so far as to say that the friendships Piper forms with these band members was reminiscent of the friendships formed in Melina Marchetta’s Saving Francesca. They were just as heart-warming and touching to read and I found myself cheering for this group the whole way. Lastly though, I have to mention Piper’s relationship with her family. Not only was it achingly realistic, but it is also so rare to see such an honest portrayal of family life in contemporary literature. I can’t do any justice to it through descriptions, but just know that it made tears come to my eyes on more than one bittersweet occasion. I can’t recommend Five Flavors of Dumb enough. If you’re a lover of music, slow-burning romance, well-rounded characters, and unfailing character friendships, then you simply must pick this book up. Five Flavors of Dumb may have been my first Antony John novel, but it will, by no means, be my last. I agree with everything you said here! I discovered this book randomly at the library, and I'm so glad that I picked it up. The characters were so great. I loved what you said about Piper. She did come across as real and honest. And I also loved that her family was such a big part of her journey thorough the book. Great comparison to Saving Francesca. I didn't think of that. But I love books like these with seemingly different people who form lasting friendships. And I remember laughing a lot as I read this one. Great review! Keertana - you really know how to sell a book. I was wary of this - music-influenced YA novels are more often miss than hit with me - but damn if you didn't make me want to give this one a try. And I love that your mini reviews are still so indept and detailed. It makes me feel like I am making an informed decision. Into the TBR this one goes! Awesome review! This book sounds really good, moving and interesting. I hadn't heard of this book until now but it looks like one that I should try I think, it's not a book I would usually read but lately I'm reading and loving a lot of books I wouldn't usually pick up. I love, love, LOVD this book! Your review made me happy since you liked it so much. I agree, Piper is a great character! And I don't think I have read another YA book where the MC is deaf. I thought that was great! Fantastic review! I love the cover for this book, so pretty! I've seen it around and it never really sparked my interest, but your review has me intrigued. I love the sound of the mc and the slow-burning romance. Will have to pick this up some time. Great review! I love how your mini review ended up being longer than most my regular reviews. I also love the idea of exploring a lovable, deaf character that offers a completely different perspective. Piper sounds worthy of my time, even though I tend to shy away from contemporary YA in general. A book that moved YOU to tears will surely do the same to me, and that is very promising. I adore how your mini-reviews are longer than "normal" review of many bloggers. I'm a more detailed reviewer myself, so I love the amount of depth you put into even mini-reviews! I'll admit that this is not a book that would have ever caught my interest (high school setting, about bands and music, somewhat typical teenage drama), BUT it seems as though writing about a deaf protagonist and her relationships and character development overall definitely helps establish the book as something more interesting and unique. I'm still not convinced that this is the type of book I would enjoy myself, though perhaps I'll reconsider this at some point. Gah, I have got to read this book! Your's is the second rave review I've read! Music themes are one of my favorite things in the books I read but when you compare the friendship dynamics with that of Saving Francesca, my very, very favorite Marchetta book? SOLD. I think I may have to buy the actual book (as opposed to a Kindle version) because I TOTALLY dig that rocker chick on the cover! Yay! Awesome review! Five Flavors of Dumb is a novel I’ve had on my radar for awhile, but one I simply brushed off a countless number of times. It was never a priority on my list, ME. THAT IS ME. I saw a lot of people loving this a while back and thought "Oh I definitely should read that." but it never progressed to ACTUALLY reading it. But now I've read your review and... damn, every paragraph is making me fall further in love with this book. I'm not a huge music buff, but strangely I've really enjoyed books with band elements or music obsessed characters. The fact that you compare the friendships to a Melina Marchetta novel, given how much you love her books, speaks VOLUMES to me. Keertana! So sorry I'm once again DAYS behind on my reader. I've had this one on my radar forever too, but never made an effort to read it. Clearly I also need to get stranded with my Kindle at some point--I could get a lot of those books read! Gah, everything I've read about this book makes it sound so wonderful, and of course you've done the same. The relationships sound lovely, and of course you know I love a slow-burn and well rounded characters. I WILL get to this one at some point!